ANY THANKS to all the readers who took part in the lively discussion thread on my previous article. The question posed was whether the permission given to all priests to offer three Masses on All Souls’ Day should be interpreted as an encouragement to do so. First, allow me to say that I view this question as one that has no definitive answer. The Church does not seem to have a clear statement on the subject anywhere. So, I consider this a matter on which reasonable minds can disagree. Having said that, I also believe that the laws, documentation, and pastoral practice of the Church give us clues that lean in favor of one interpretation. Thus, my own answer to the question as posed is an unequivocal yes. I will endeavor at this point to explain why, while at the same time responding to some of the points raised in the discussion thread. T THE OUTSET, let me acknowledge that the pastoral reality in many places is that priests binate, trinate, etc. very often (weekly, if not more frequently). I do so, myself, a couple of times a week on average, with the mix of weddings, funerals, daily Masses, and Sunday Masses in a busy parish. But let us also acknowledge that this is not a good thing. In many places, it is necessary for the good of the faithful, but the laws of the Church that limit priests in their offering of Masses exist for good reason. The discussion of how often these limits are exceeded (whether through disregard or through genuine pastoral need) has no bearing, however, on the question being asked. The laws as they are written are very strict; they guard against bination quite strongly, with notable exceptions for All Souls’ Day and the Nativity of Our Lord. The fact that three Masses are permitted in the law only on two days of the whole liturgical year is a clear sign that there is something unique about these days. All Souls’ Day is formally called the “Commemoration of All the Faithful Departed.” On the food chain of liturgical celebrations, a Commemoration falls very low. (Other examples of Commemorations would be saints’ days that fall in the strong seasons of Lent or Advent.) Above Commemorations, the Church observes Memorials and Feasts. Then, at the very top, there are Solemnities. Thus, it cannot be on account of the liturgical solemnity that priests are granted such special permission. 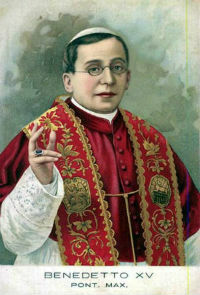 Exactly 100 years have passed since the bull of Pope Benedict XV authorized the trination on All Souls’ Day. The early 20th Century, of course, was a time very different from our own, and it would be unfair to impose certain modern considerations upon our evaluation of the permission this document granted. For this reason, I do not think that issues such as a vocations crisis or clergy “burn out” can be understood as the reasons for this exceedingly rare permission. Nor do I get any sense that this provision is made so that more of the lay faithful can attend Mass on All Souls’ Day. While there is nothing wrong with that—in fact, that would be a wonderful thing—nothing in the law gives any indication that this is a motivating factor. I think, rather, that an argument made on these grounds would be another case of imposing modern preconceptions upon legislation from an earlier time. From my perspective, the most convincing explanation for this unusual permission is that Holy Mother Church wants to extend herself as much as possible in support of the Holy Souls in Purgatory. The allowance for three Masses per priest, I believe, is an act of mercy meant primarily for the benefit of the Holy Souls. Of course, no one doubts that every Mass benefits the Church Militant and the Church Triumphant, too, but it would seem that the good of the Church Suffering is the reason for this legislation. Another factor that supports this perspective is the presence in the Roman Missal of three separate Mass formulae for All Souls’ Day. Only this Commemoration and Christmas Day are afforded such a generous treatment in the missal. (The history of the three Masses for Christmas is entirely separate; a good summary is available here.) It would be unconvincing to suggest that these formularies are extra, or superfluous, since the missal does not make a habit of offering multiple Mass formularies just so that the priest may choose one he prefers (examples such as the Ritual Masses for Marriage and various Commons are distinct, inasmuch as they are not assigned to one particular day). Much more likely, these three sets of orations are provided because there is an expectation that they will be needed by a priest who is trinating. For all of these reasons, I gladly trinate every November 2nd. Few people were at those first Masses celebrated on the hill of Wawel: among others, I remember my godmother Maria Wiadrowska, my mother’s elder sister. The altar server was Mieczyslaw Malinski, who in a way made present the spirit and person of Jan Tyranowski, at the time already seriously ill. I hope that this discussion has been beneficial. Above all, I hope that the prayers we offer during this month of November are beneficial for all our beloved dead.